I hope you’ve had a good weekend! Mine has being great and today I want to share a review of a series that I read recently. 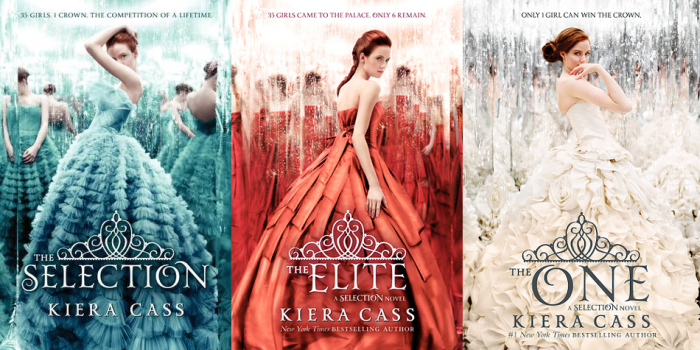 The Selection Series, by Kiera Cass. * There are also several novellas that accompany this series. Here is the link to the amazon page of the Author where you can find all of it. The best way for me to try and resume this series into a one sentence description its to use some comparison. To me it was a bit of “The Bachelor” (the one on tv in the US) but put into a dystopian setting in order to get a different reaction because of it. Now for those of you who don’t know what The Bachelor is, I will explain how it pertains to the books. The stories of this books are following closely a girl Named America. She is a 5, which means that in society she is behind in the class category. She and her family are artists and there for earning a living is hard when you depend on being hired for parties and the like… Her mother is pushy and wants her to enter the Selection, for she thinks this is the best way for the daughter to get out of the classification their society has pushed on them. The category’s pertain directly to the jobs performed by the population, the lowest, #8, are the homeless. The Selection (here is why I compare it with the bachelor, since its sort of the same thing, without this class classification…) is the process in which the Prince (Maxon) will chose his wife out of 35 girls from the kingdom. All of different social classes… How ever, America has already given her heart out to Aspen, a boy she’s known all her life and that she adores. How ever he is a 6 and if they were to marry, she would also become a 6, something that has had them concealing their relationship since the beginning, both because the law forbids any sort of close encounters between couples before marriage, and because she knows her mother would not approve of her lowering he caste to marry him. The story is not to complicated at first, how ever, it does become so. America has to figure out if she wants to be there for herself and not for her family. Competition is hard, and all the girls are not as nice as she expected them to be. In the mean time, Maxon and America, both being from very different upbringings have found some common ground with in each others way of thinking and get along rather well. Sometimes better than others, of course… This is their story first and foremost. I hope you enjoyed this review. Don’t forget that I am also in the video portion of the IGeekBooks Blog on Youtube, with something new, reviews and TBR lists, etc… every week. Here is the link to those videos, don’t forget to Subscribe to get notified when a new one is uploaded. PS: did anyone read “The Heir” by Kiera Cass. It’s the last book and I read the synopsis and was not sold… What did you think of it? Leave your comments below and please tell me what you think!! As always, I hope you have a great book keeping you company. Posted on November 2, 2015 November 2, 2015 by ccalvarez90Posted in UncategorizedTagged #AudioReview, #BookReviews, #BookTuber, #IGeekBooks, #igeekbooksreview, KieraCass, SelectionSeries. Previous Previous post: Kristen Proby New Cover Reveal!